Picture yourself sitting in a private balcony, a cool breeze blowing lazily as you sip into freshly brewed coffee. It’s your vacation and all you need to do here is read a book, go cycling in the paddy fields or just relax by the humongous pool. Isn’t this what we want from our time off from work? 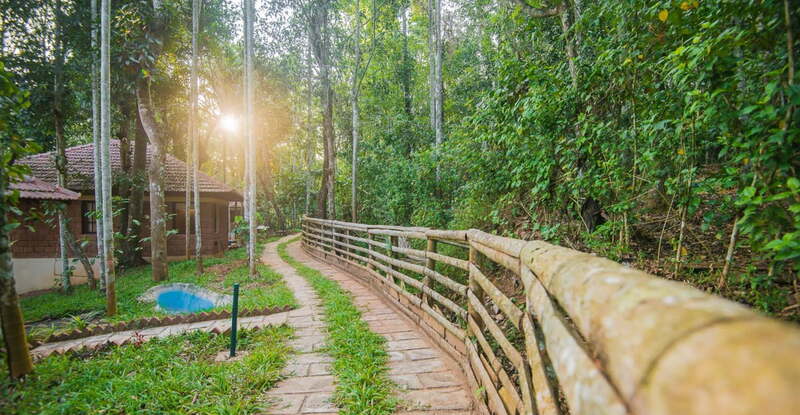 Raindrops Resorts – A new luxury resort in Wayanad that is pet-friendly! From coconut trees to beetle nuts, from the pungent pepper to the sweetest pineapples, from coffee estates to paddy fields and from continental cuisine to authentic tribal food – this place in Kerela has it all and even more. No wonder we feel absolutely relaxed and refreshed coming here time and again. The color of the green paddy fields in front of the property makes you feel God has generously painted it adding some extra saturation to the whole landscape. We miss this greenery in the city and the tiny things such as the sun rays piercing through the raindrops, dangling on every paddy strand creating an illusion of millions of rainbows is mesmerizing. I guess that’s why Madhu, the owner of this beautiful place lovingly named his property Raindrops Resorts. On our first visit to Raindrops, we were already sold to the beauty of the property by just looking at the vast stretch of greenery right in front of the entrance. It’s such a soothing sight since we spend most of our time in concrete jungles. As we drove the car to the parking lot, the whole topography of this place changed. From paddy fields, we were now amidst coffee plantations! Wow! This was a big surprise. The entire property had coffee, beetle nut, pepper and different varieties of fruits growing in it including pineapples. Check out the most off-beat yet dreamy hill stations in South India! As we walked into our villa, we were taken aback at the first sight of the lovely decor and the cute little sit out which opened up to a view of the paddy fields. Wow! From this balcony, you could hear the chirping of the birds and the rustling of leaves in the cool breeze. I could sit here for hours reading a book and listening to this priceless serenity. A small nap would also be a great idea when you are in such a place. A private space in a spice forest! Impeccable personalized service, gorgeous private villas surrounded by greenery, delicious food, and an Instagram-worthy location are just some of the reasons we loved our stay at Raindrops Resorts. Don’t you just love these beds! The interiors of the room were very carefully designed keeping in mind that every single element present in the room should connect with nature. The window blinds and curtains were made by the local tribal people and the table lamps had the prints of leaves imprint on them which not only made it look beautiful but also made us feel and believe that our host was truly an admirer of nature. Each villa is a private space for the guests who come here and surrounded by fruit-bearing trees all around. Even though you are in the middle of an estate, you’ll find every comfort you could expect of a hotel. The great air-conditioning, coffee maker, sit outs, lovely bathtub, and delightfully plush king bed all made it difficult for us to leave the comforts of our little “home”. It was noon and lunch was ready. The on-site restaurant was right outside our villa and we could soak in the aromas of freshly ground spices! The chef, Vipin is a young guy and totally loves cooking. Not only does he cook good continental food but Vipin has also been trained in tribal Kerala cuisine. He has spent months with the tribals learning their art of cooking and that’s exactly what he serves in his kitchen. On our table was a big banana leaf and the staff kept serving us titbits such as pickle, gunpowder etc before the main course was served. Vipin got steaming hot Kerala rice and dal along with 4-5 different types of items which included traditional fish gravy and some yummy vegetables made in the curd. But the best came a little later. As we peeped into the next dish, we saw some golden brown chunks of fried chicken, sprinkled with coconut on top. This wasn’t the usual fried chicken kebab and taste very exotic. This was one of the dishes he had learned from the tribals. Probably the best, fried kebabs we had ever tasted till date! Whether you’re looking for a gastronomical lunch or a light dinner, you’ll find something to satisfy your cravings at any time of day. Post lunch, we explored the resort in and out. The property is spread across 3 acres. It has 13 beautifully designed cottages, a swimming pool, an activity area and bonfire for chilly nights. We were also happy to know that Raindrops is a pet-friendly resort. This is such a relief for pet owners as they now have a resort where they can bring their pooches. We immediately knew that this would be our place to go the next time our pets are in Bangalore. Traveling with Pets? Here’s all you need to make the trip hassle free! By evening Vidur and I decided to take a bicycle ride through the paddy field for the sunset. As we sat in the field, watching people go back to their homes, we witnessed one of the most beautiful sunsets! The horizon was clear and you could see the sky changing its colors from blue to orange. The sky sounded busy as hundreds of birds flew home, the little ones following their parents into the horizon. Ready for my evening ride through these beautiful fields! It was now time for a steaming hot cup of coffee. As we sat on the dining table waiting for the coffee to come, we are introduced to Madhu’s cousin. Our evening got quite interesting as Madhu’s cousin told us interesting facts from Wayanad’s history. It was soon time for dinner. And it was a traditional Kerala meal! Hot and crispy Kerela parothas with traditional chicken gravy which I will never forget in this lifetime. I haven’t tasted something so yummy and delicious in a long time. Apart from the yummy lunch, we had earlier. Love cycling? Tried BIKEPACKING? Here’s everything you need to know about it. Breakfast the next day was even more traditional. We tried chickpeas curry known as Kudle curry and Puttu which is a traditional Kerela dish made of rice flour. We were all set to head back but we knew we were coming back to Raindrops very soon. If not for anything then surely for the awesome food we had! And as luck would have it, we traveled to Kerala for work the next week and dropped into their restaurant for the chicken kebabs, parotta, and chicken curry! Just can’t get enough of their food. Passport Lost While Traveling? Here’s What You Can Do! Beautiful Pictures and so valuable information. Thank you for sharing your experience. keep up the good work. God bless you.